Our focus at AZEERA is simply to capture all the quality features you’re looking for in a gemstone by providing top-level gems with distinct colors, clean polishes, and precision cuts. Crafting gems is a delicate art and AZEERA takes our process seriously. We are passionate about ensuring not only a high quality product, but also educating our customers about industry standards. Unlike diamonds, colored-stones are not graded under a universally accepted guideline. There are many intricate factors that influence the value of color gems, and while the definition of the 4 C's analysis remain the same, the distinctions between poor to excellent can be loosely assigned. The world of color-stones is vast and each mineral is unique in its optical and physical properties, thus making it difficult to apply a standard grading system. A gemstone’s color and brilliance is directly related to the way it interacts with light. The reflective index measures the way in which light bends and slows as it travels through the stone. The refractive index not only tells us about the optical properties of a stone, but also will often determine the way a stone is cut to enhance its brilliance. The modern, round cut often seen in diamonds is a template used to optimize the brilliance and fire of a diamond’s refractive index. The style was invented by Belgian mathematician Marcel Tolkowsky and was developed around a diamond’s crystal structure and optical properties. Diamonds have a refractive index of 3.52, which means that light traveling through a diamond slows down 3.52 times. Notice in the chart below how the refractive index (RI) varies for each of our colored stones. The four precious gems (diamond, emerald, ruby, and sapphire) are often cut in the diamond cut style, but have varying face-up appearances. The angle and position of each facet determines how we view the brilliance. While it is not difficult to achieve the same brilliance of a diamond in a colored stone, producing such a stone would be impractical for a number of reasons. Diamonds are cut according to dimensions that will bring out their greatest brilliance. This usually means the depth of a diamond makes up 60% of its diameter. If we were to apply the same principle to a gemstone, the dimensions necessary to maximize brilliance would create a stone that would be nearly impossible to set. In addition, each gem would require its own unique cutting pattern, which would be very difficult to achieve. The depth of a gem will impact its overall appearance. The precious topaz on the left is cut too shallow and has windowing in the center of the gem as a result while the precious topaz on the right is cut too deep and has windowing around the table facet. 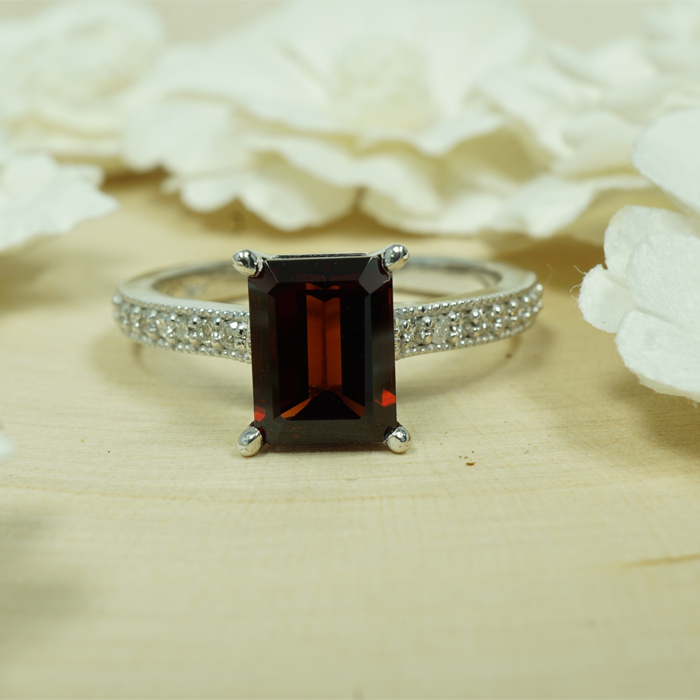 The center precious topaz is an ideal depth and has a pleasant balance of brilliance, windowing and extinction. In addition, diamonds are part of the cubic crystal system, which means that light inside the crystal travels at the same speed in all directions. 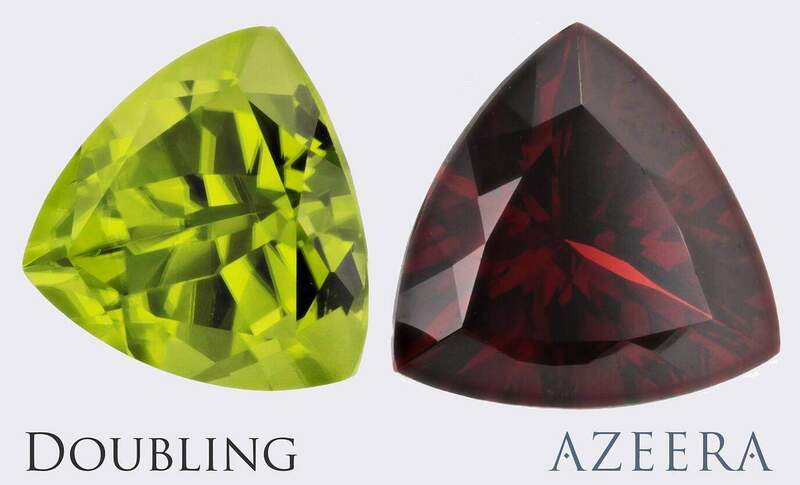 Colored stones in the AZEERA collection, with the exception of garnet, are not cubic. Instead they are known to be Doubly Refractive (DR), which means that light entering the stone splits into two beams and travels at different speeds depending on the angle of the stone. The RI within each DR stone can also vary depending on the viewing angle. In order to meet empirical standards for DR colored stones, each stone variety would need to be cut at the same angle with respect to its crystal habit. This would be highly unfeasible, as determining the crystal orientation of a piece of rough is very difficult. Doubling is when a doubling refractive gem show evidence of light splitting as it enters the gem. The peridot on the left displays strong doubling, while the garnet displays none as it is singly refractive. At AZEERA, our focus is to provide stones with distinct colors, clean polishes, and precision cuts. We use a modified round cut that allows for a pleasant balance of brilliance, extinction, and windowing while maintaining proportions that meet jewelry standards. We feel that it is disingenuous, insufficient, and most of all misleading to label our stones as AAA or anything else, as others freely do in the industry. We hold ourselves to a high standard that goes beyond subjective grading and are proud to provide this standard to you in all of the pieces we craft.